The wine world these days is full of choices. There are literally thousands of wine grape varieties in the world today, and so many different styles of wine to explore. It’s a wine explorer’s paradise out there! But with so many options often comes agonizing indecision. What to try? Few wine regions represent an abundance of choice more than Temecula Valley, home to dozens of different grape varieties produced in a dizzying array of styles. Want light and crisp? Try a Temecula Valley Sauvignon Blanc. In the mood for something juicy and rich? Temecula Valley Tempranillo may very well fit the bill. What about bubbly? Temecula Valley’s got that too. Choices, choices. In an effort to help you narrow down what to try while exploring the region, just named one of the Top 10 Wine Getaways in the World by Wine Enthusiast Magazine, we’ve identified four shining stars that are worth discovering in Southern California Wine Country. 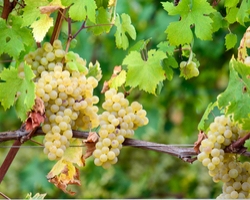 This white grape variety hails from the Piedmont region of Northern Italy. In the region’s local dialect, the name translates to “little rascal,” presumably a moniker earned from the grape’s relative fussiness when it comes to cultivation. In Italy, the grape is naturally low in acidity, producing dry, full-bodied wines when handled well. In Temecula Valley, Arneis seems to offer more acidity than one might expect, and is capable of producing bright, fresh wines with notes of juicy pear, citrus, white flower blossoms and hazelnut. Vermentino is an aromatic white grape variety most associated with North Western Italy, Sardinia, Corsica and Southern France. Although Vermentino is considered a light, fresh wine, it can often boast some depth and unique characteristics such as a hint of bitter almond and a slight briny note that brings to mind picnic lunches by the seaside. In Temecula Valley, Vermentino finds a richness that makes it equally at home by itself or paired with food. It is fleshy and fruity, with aromas of ripe, juicy apple, white peach, pink grapefruit and lime zest. Sangiovese is Italy’s most planted wine grapevine, and particularly common in central Italy where it is the principal grape in Chianti. It has many different clones and is capable of producing easy-drinking, fruity table wines or more complex, premium wines intended for aging, like Brunello di Montalcino and Vino Nobile di Montepulciano, depending on where it is grown and how it is produced. In Temecula Valley, Sangiovese rarely takes on a simple quality. Instead, the wines are rich and full-bodied, displaying ripe fruit and plenty of textures and aromas from oak treatment. The Sangiovese grape is truly at home in Temecula Valley, with many visitors even comparing the terrain to the rolling hills of Tuscany. Syrah finds truly exceptional expression in the warm, Mediterranean climate of Temecula Valley and the best are certainly capable of aging right alongside their prestigious cousins in France. Southern California Syrahs are robust and expressive, with gorgeous texture and structure, firm tannins, spice and the signature black pepper note we all know and love in Syrah.